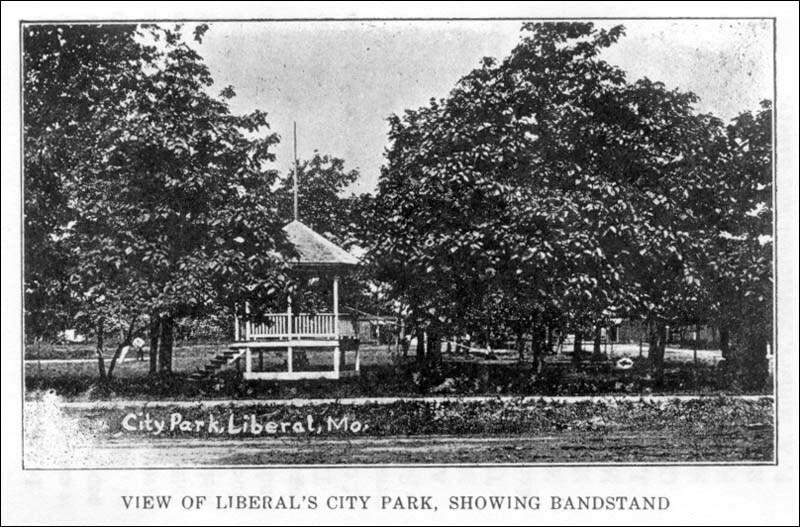 When Liberal was founded, there was no railroad connection between Liberal and the outside world. The Kansas City, Ft. Scott and Memphis railroad was in course of construction, but was not completed till 1881. The Missouri Pacific came in 1885. It was the boast of Jay Gould, who was the main backer of this road, that he would make a cattle trail of the other railroad. He failed dismally to make good his boast. The first railroad now known as the “Frisco” (St. Louis and San Francisco) is one of the leading railroad lines of the country. The Missouri Pacific has grown into big proportions, and Liberal, since 1885, has had two railroad outlets. The first building erected in Liberal was built by Capt. W. S. Guffy, father of Arthur Guffy, and was a hotel. It stood where J. F. Mohler holds his barber shop. W. A. Delissa was the first merchant in Liberal. Later he ran a store in Pedro. Orthodox Christians felt uneasy in the Freethinkers’ town; so there was an “Exodus” from Liberal to Pedro about 1885. The latter place being so near at hand, no cloud by day or pillar of fire by night was needed to guide them. Their “Moses” was Morris and Goss who were the chief agents in moving the stores; and so many of them went that only one, Todd & Company, was left in Liberal. Of course others in private business followed, and it looked for a time as if Pedro might outwit Liberal in display of population. Rube Morris, one of the leaders of the “Exodus,” now lives in Denver. The “Exodus” to Pedro could not keep the Free-thinkers’ town from growing. Dry goods and grocery stores sprang up, and the town steadily grew. The firm of Todd & Co., later became known as Todd, Thompson & Co. This store was finally owned by John H. Todd. Frank Yale early ran a livery stable, and we note by an issue of “The Liberal,” of January 3, 1884, that Mr. William Hesford bought a one-half interest in the stable. Mr. E. H. Wheeler, who later ran a confectionery store, was in the livery business about 1888. The livery stable in those days was a far more important institution than it has been since the coming of the automobile. each year many thousands of collars to the people of Liberal and vicinity. Two steam shovels are now opearting adjacent to Liberal; one near the old Boulware farm, and the other near the home of Mr. P. T. McClanahan. Add to the coal industry, the corn, wheat, hay and fruit produced, and it is easy to see why Liberal has been a hard town to kill. Blackberry culture, some twenty-five years ago a leading branch of fruit culture here, has been nearly abandoned for more profitable lines of fruit growing. Mr. M. L. Jackson, however, still raises many blackberries and is a leading fruit grower in this section. One serious setback to Liberal was the great fire which occurred in November, 1897. This fire swept the west side of Main Street from the hardware store of Conrad Brothers to the hardware store of L. L. Coleman. The burned district was soon rebuilt, in spite of the heavy loss. It did not take long for the business conditions of Liberal to warrant the establishment of a bank. Mr. G. W. Baldwin came to Liberal in 1888 and started a bank in that year. It was known as the “Bank of Liberal.” Later Mr. Baldwin organized the Exchange Bank, and after it passed from him it was known as the “First National Bank.” It is now known as the “Farmers State Bank” with Mr. Jas. B. Smith as president and Mr. C. B. Armstrong as cashier. The Bank of Liberal came under the control of one Mr. Bollinger for a time, but about twenty-eight years ago passed into the hands of J. G. and son John H. Todd. J. G. Todd and his sons still hold a controlling interest in it and it is known as “Todd’s bank.” Both the Bank of Liberal and the Farmers State Bank seem to be on a sound basis, and doing a good business. It may not be out of place here to note the growth of Liberal’s population. Sechrist & Sons, Hardware and Furniture. A. B. McIntosh, Hardware and Machinery. Moore Drug Company, A. M. Moore, Manager. The Leader, Dry Goods, O. N. Eddlemon, Manager. Mohler Mercantile Co., Dry Goods and Groceries. M. H. Bryson, Dry Goods and Groceries. Farmers Grocery Co., A. N. Wimmer, Prop. Farmers Exchange, Arlie Bowman, Manager. F. A. Minnick, Restaurant and Bakery. G. R. Crank, Meat Market. Mrs. E. A. Wilson, Racket Store. Smith’s Clothing Co., Wilbur Smith, Manager. Dickey & Morrow, Second Hand Store. Liberal Produce Co., Chas. Pomatto, Manager. J. E. Wicker, Veterinary Surgeon. Lipscomb Grain & Seed Co. Farmers Mutual Fire INsurance Co., John H. Todd, Secretary. Baldwin Lumber Co., R. L. Baldwin, Manager. Barton County Lumber Co., W. H. Curless, Manager. Liberal Broom Co., Fred Mellor, Manager. Max Davidson, Garage and Wholesale Oil. Reed Bros. Motor Co., Garage. J. A. Coy & Son, Harness Makers. A. H. Wilson, The Ozark House. I. G. Morgan, Manager of Brick Plant. J. H. Brown, The Liberal Nurseries. W. S. Jones, Wagon Maker. Roy Smith’s Service Station, Garage. Liberal Light Co., Electrical Supplies. Lyric Theater, Chas. Travis & Son, Proprietors. Ozark Finishing Co., H. Bouton, Manager. Liberal Coal & Mining Co.
Todd Bros., Real Estate and Insurance. Liberal Land Co., Jackson & Moore, Proprietors, Real Estate. J. O. Pinkerton, Real Estate and Insurance.